I love everything here, the stripe with the check - I'm not sure if it even "goes together" but when it looks this good why even ask. I also really love the club collar shirt, so often they come off looking costumey but here it looks so natural. Comments on "On the Street.....Checks & Stripes, Milano"
O I love this ! Who cares if it 'goes together' ? Because he wears it confidently, he makes it looks great ! It`s all about additude and this guy means business! Great look!! Great style, it looks so unforced. To use an old-fashioned word: natty! The club collar looks good although in this context it could be seen as an anachronism. My favorite thing about the look is that the presence of the casual quilted vest and his other things suggests (and it may not be true) that he might dress like this all the time- I can imagine that this is just another day's attire for him, which is a nice thought. The monochromatic palette lets the patterns be the whole story. They are also well scaled to one another. I almost think the shirt collar is one distraction too many, but it isn't fatal. I think the colors and patterns work. They make the outfit interesting while still being tasteful. I think that the vest could fit better. It seems to be pulling at the buttons in the middle. I suggest that he leave the bottom button on the vest undone. I'm not a fan of the club collar shirt. It always makes me think of Peter Pan. I think that style of collar looks great on women and on young children, but for men I stick with straight, spread, button down, or tab collar styles. club collar shirt is my thing too... in fact, that's what i wear at work often... i would have taken that vest off though. the check/stripe is clever. However, well dressed this individual is, it dosent mean that it is really all that interesting. You can look at past posts and compaire to others who are dressed the same way. Not to say that fashion has to always be fresh, put being none compareable, such as the post below"pleated pants" is ideal. I am just delighted that, in the middle of a global financial crisis with banks collapsing all over the place, we have a great time here discussing shirt collars, colors, textures ....just love it !!! I love how menswear gives off a playful whimsy, with a little mismatch pairing with a tie and vest. He knows. He looks great. I would don his waistcoat on, is it me or are the clothes old men wear coming into fashion? i absolutely adore your photos. how are you able to capture those moments?? I do think that actually they go together...and i find it amazing to tell the truth =O!! he's great-looking. love everything here. he's a natural! Why not, right? Clashing always signifies a strong fashion sense, anyway. Or at least a unique one! 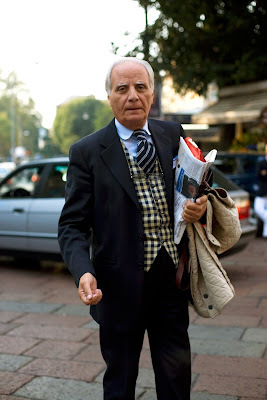 There is something about Milanese Italian men and the way they dress that makes everything look good... even those things which were never meant to be worn together like stripe and check mix match! His look is pure perfection! Caramba! que combinación más atrevida: cuadros y rayas pocos sutiles! His attitude...he just pulls the look off so well (and isnt it usually the opposite? As you age, daring looks/mixing of patterns become harder to pull off...)...Wonderful Shot! He looks great but please DO NOT ATTEMPT THIS AT HOME. Awwwwwww that vest is divine. Kudos old man. this is a great outfit. your right the collar is amazing in this ensemble. This is a gentleman with a little more swagger than my grandfather ever had. I think one of the best things about this blog, aside from the wonderful photos, is that it underscores the notion that 'fashion' and 'looking good' is not limited to the 20-something individual. One can proudly look great at any age! What about the jacket he has over his arm? Barbour or something? I would love to see that over his ensemble. Ca c'est bien, biensure. It seems alot of these milanese businessmen types are carrying a pile of stuff with them. That mess (the jacket, daily paper etc.) almost makes the actual look seem dandier. Ah yes, just going about my daily route, arms full of crap, looking fantastic as usual. like putting on that vest wasn't even a stretch for him. You're right sart, this is inspiration. My favorite photos are ones like this, ones that give off a very 'real' feel. This is accessible. MMmm. not sure if managing the colour is the right word. I think a play on color based on seasonal themes and ones own personal persona and aesthetic could be more intriguing.Though this picture is very nice i think that its a classic take on men attire. Its a wonderful picture.A very Ralph Lauren or brooks brothers look. Absolutely. If some can rock it well, who cares if it "goes together"? He looks charming. I like it! Anything at all aesthetically pleasing does go together. Period. You have to give it to the italians, it's not all fashion but always style. I do belive an englishman would have unbuttoned the last button? He's wonderful. He can wear whatever he likes but obviously has a knack doing it right. i didn't even notice the club collar until you pointed it out, that's how natural it looks. he definitely pulls it off. and acts like he isn't even trying. 4 stars for him.